The Mobile Pantry Program directly serves clients in an effort to supplement other hunger-relief agencies. A truckload of food is distributed to clients in pre-packed boxes or through a farmers market-style distribution where clients choose what they need. 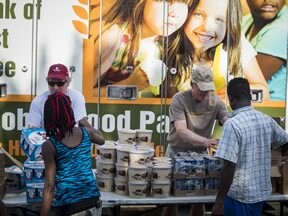 The Mobile Pantry Program expands the capacity of the Feeding America network to distribute food by removing barriers that prevent access to underserved areas, and allows for fast and flexible delivery of rescued food and grocery products including meat, produce and baked goods. Any Johnson City Housing Authority resident can receive a food box once each month from our Resident Services’ Food Pantry. Distribution is third week of each month at Memorial Park, Keystone, Parkway, Dunbar, and Fairview, Lake Terrace, Carver, and Pinecrest. The food box is available to all eligible recipients regardless of race, color, national origin, age, or gender. Call 423-926-3225 before the week of distribution, and we will put your name on the list. If you are unable to pick up your box, a volunteer can deliver to you. This program is made possible by generous donors and community donors. Volunteers are also always needed to sort, box, and deliver. If you can help, please call Resident Services at 423-926-3225.